Today's walk passes Loch Fitty to an area which is undergoing the astonishing landscaping of Fife Earth Project. A path through Blairadam Forest leads to delightful Keltybridge. 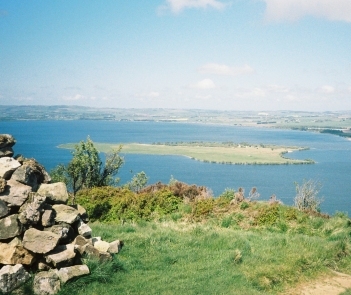 Three more hills beckon: Harran Hill with views over Loch Ore Meadows Country Park; Benarty; and Vane Hill overlooking Loch Leven and Castle Island where Mary Queen of Scots was imprisoned. 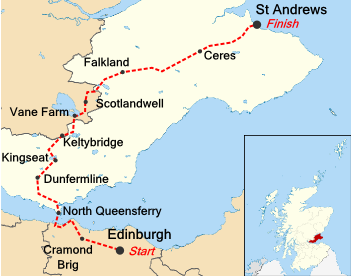 Soon we can avail ourselves of the RSPB’s visitor centre by the Loch [coffee shop] and then we head along a section of the Loch Leven Heritage Trail to Lochend Farm Shop, and along a track to Scotlandwell where Robert the Bruce hoped to cure his leprosy.